Ever since I could remember A Charlie Brown Christmas was an annual Christmas tradition for me. And when it first came to DVD, it became an anytime tradition. It remains a timeless classic more than 45 years later. But a few years ago, I discovered what could be considered the British equivalent. The Snowman is an equally timeless classic that I have been so lucky to discover stateside. 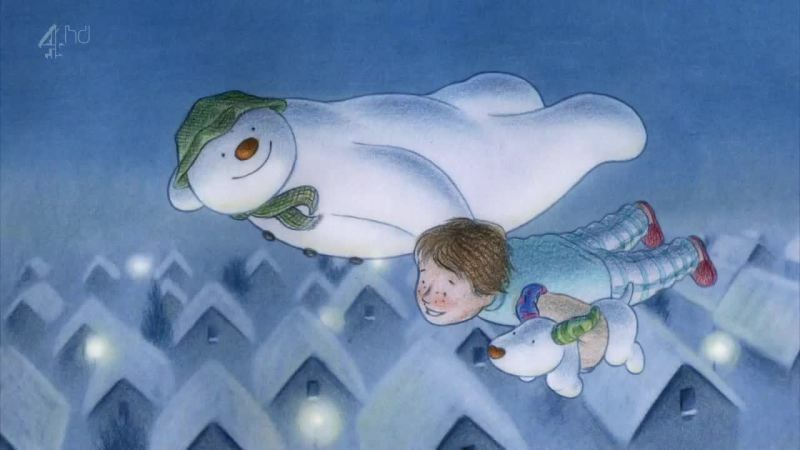 The 1982 British classic adapted from Raymond Briggs’ children’s picture book is an amazingly whole hearted, sincere and touching story of a young boy’s adventure with a snowman that’s come to life. The presumed setting of a snow-covered English countryside gives the wordless short film a warmth that sets the mood for what is an emotionally fulfilling night of adventure. Fun and amusement to love and loss, The Snowman tugs at all the right heartstrings while highlighting friendship and the warm feelings of the season. But of all days, yesterday on Christmas Eve, color me surprised when I learned there’d be a sequel AND it would premiere in a few hours. While the idea of creating a sequel to such an iconic short film like The Snowman may be unthinkable to some (including author Raymond Briggs himself), The Snowman and The Snowdog is here. Premiering Christmas Eve on Channel 4, The Snowman and The Snowdog manages to capture the general essence of the original. While it’d be difficult to match the original’s heart and sincerity, this new half-hour special takes the foundation of the story and gives it a 2012 flavor. The difference between the two could be best seen when looking at the choice of music for both specials’ what would now be signature flying through the air sequences. You certainly can’t duplicate the impact of the iconic, de facto theme of The Snowman, “Walking in the Air.” The new special decides to go with an original modern Brit rock track, “Light the Night” by Andy Burrows which evokes a similar, yet very different feeling of flying across snow covered landscapes. “Walking in the Air” was dreamy and contemplative, almost sad and solemn at times, but with a childhood innocence that gave hope. This new theme, “Light the Night” is very 2012, a more uplifting song and modern that may appeal to a new generation of children. The Snowman and the Snowdog beautifully reflects how much has changed in 30 years. The Snowman is just as big and cuddly as ever, the new little boy is just as good a friend as the first one and the new Snowdog is adorable. But seeing modern London and the original home now part of a row of houses with a considerably smaller backyard really gives the familiar story a very modern twist. Comparisons to the original are unavoidable. But The Snowman and the Snowdog has no problems living up to the heart and warmth of the original that brings the season closer to home. A touching and moving half-hour that is more than a worthwhile experience. I mean, it’s pretty hard not to like seeing the warm, friendly, curious Snowman with the familiar green hat and scarf again. With cute little dog in toe. But the new story adds an extra bit of sentimentality and poignancy while also being similarly melancholic, especially at the end. We get another bittersweet ending of course, but this time, there’s a little bit more to be happy and hopeful about. The Snowman and the Snowdog is both a contemporary and classic tale. And like the original, it has all it needs to prove itself to be a timeless and universal story. The Snowman and The Snowdog is very much a welcome addition to the annual The Snowman traditions of millions of families in Britain and around the world.